Masonville Cove, once a recreational area for local citizens and most recently an abandoned and neglected section of shoreline along the Middle Branch of the Patapsco River, will soon be a thriving natural area in Baltimore City once more! When the Maryland Port Administration (MPA) created a new Dredged Material Containment Facility at the Masonville Marine Terminal, it designed its mitigation efforts to focus on not only the natural environment, but also the residents of the surrounding communities. As part of the Baltimore Harbor Dredged Material Management Plan, MPA agreed to provide a package of community enhancements intended to initiate meaningful stewardship opportunities for neighborhood families to connect to the natural world. At the heart of the project is the Masonville Cove Environmental Education Center, designed to be a model for urban environmental education, as well as a catalyst for community involvement. The list of enhancements also includes a bird sanctuary, hiking trails, a fishing pier, and several tidal and non-tidal wetlands. In 2013, the Aquarium Conservation Team (ACT! ), along with local students and volunteers, planted close to 11,000 native wetland grasses along half an acre of restored wetland at Masonville Marine Terminal. These efforts will be part of the long-term mission to revitalize the Baltimore Harbor, and will help to create valuable aquatic habitat right here in Baltimore City! This fringe wetland will create foraging ground for fish species like striped bass and white perch, and will provide nesting habitat for shorebirds. Just upstream from Masonville Cove lies Farring-Baybrook Park, one of the largest open spaces in Baltimore City. Sadly, years of neglect have left it overgrown and vulnerable to dumping of debris items. As a cornerstone of the Brooklyn and Curtis Bay communities and a large part of the Masonville Cove watershed, it was a natural choice to involve stewardship of the park as part of the environmental restoration of Masonville Cove. Starting in the fall of 2013, we joined with Baltimore City Department of Recreation and Parks as part of a city-wide initiative to plant trees and improve natural spaces throughout Baltimore. Keep an eye out for opportunities to join us as we work to clean up and restore this city treasure! Masonville Cove Environmental Education Center is looking for volunteers who love nature and enjoy sharing their passion with others! Friends of Masonville Cove work to improve and manage this urban wilderness area, as well as introduce other community members to the educational and recreational activities Masonville Cove has to offer. 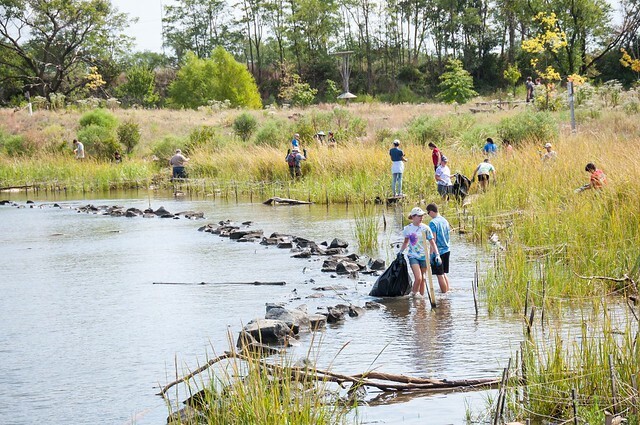 If you are interested in a long-term volunteer opportunity involving everything from debris cleanups to gardening to scientific wetland monitoring, please email friends@masonvillecove.org for more information. And check out the Friends of Masonville Cove Facebook page for updates and event announcements. Through the Masonville Cove Small Watershed Action Plan Process, the National Aquarium and our partners have worked to expand the reach of restoration and environmental education efforts upstream into the target watershed and bring together diverse partners and volunteers all working to improve the health of the Masonville Cove watershed and the quality of life in the Brooklyn/Curtis Bay communities.